We are proud to support the world-wide ministries of Compassion International. We support their mission, what they stand for, and how they operate. in Jesus’ name” (We especially love that last part). We are active sponsors, and we are blessed to have been given the opportunity to sponsor a child, “our little girl,” in Tanzania, Africa. What a joy and blessing! We write to “our Miss Neema” often, and she always writes back! We share pictures, questions and answers, and always include each other in our prayers. Carol is quite the scrap-booker! 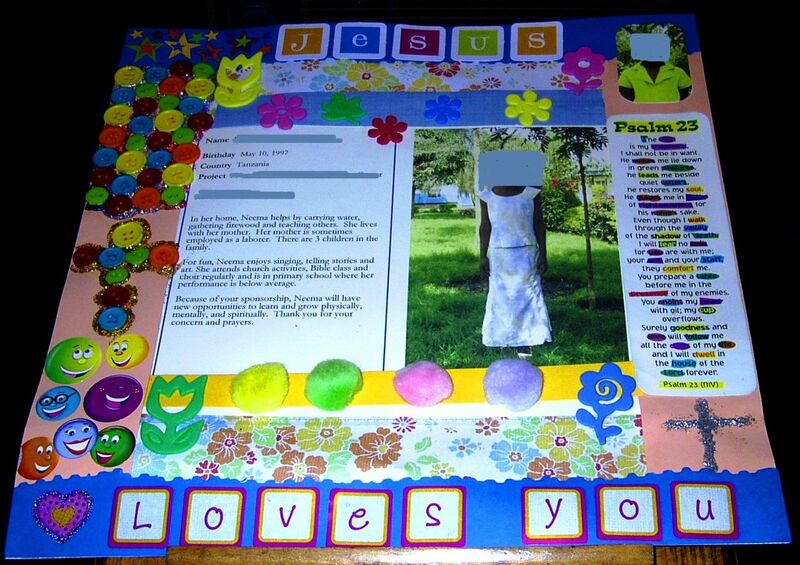 So, she designed a scrap-book page just for Neema. Since Carol couldn’t mail the whole page, we took a picture and mailed the picture to her! Below is a link to the Compassion International Website, which has a multitude of information, videos, and the many ways which you can help and support what they are doing in children’s lives all around the world. Please allow us to mention just a couple of things that make this ministry, and child sponsorship, so precious: When you sponsor a child, you sponsor and stay connected to that child all the way to adulthood. Though school, ministry training, and so on. The goal is for your child to then go on, as an adult, and do their own part to “change the world.” And, because you can stay connected, you are a part of their lives every step of the way. When you sponsor a child, that child stays sponsored … even if circumstances in your life dictate that you can no longer be a sponsor. They don’t leave the child “unattended.” Should you stop being a sponsor, Compassion International picks up the sponsorship until a new sponsor steps forward. We became a child sponsor after a presentation at our church, given by one of our members, on what Is called, “Compassion Sunday.” We felt God’s call to step up, and we are so glad we did. Small monthly steps in an eternal journey. This entry was posted in MINISTRIES WE SUPPORT and tagged Child sponsorship, Compassion International. Bookmark the permalink.